Machining for Hobbyists Getting Started Sale! Machining for Hobbyists is for the do-it-yourselfer or hobbyist who wants to learn the basics of machining and how to set up a small home workshop. 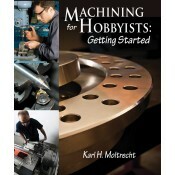 It provides a user-friendly explanation of the essential tools, materials, and techniques that hobbyists need for a variety of metalworking projects. Tips from the pros writing for Home Shop Machinist magazine are included, as well as a foreword by the magazine’s editor. Guides hobbyists in selecting the proper tools for working with metal, including tips for buying and using bench-top lathes, mills and drill presses. The book also covers the various cutting components used on these tools. Provides suggestions for shop layout, including space requirements, lighting, ventilation, and safety. Guides the reader through the use of specialty tools used for measuring and handling small metal parts. Notify me of updates to Machining for Hobbyists Getting Started Sale!